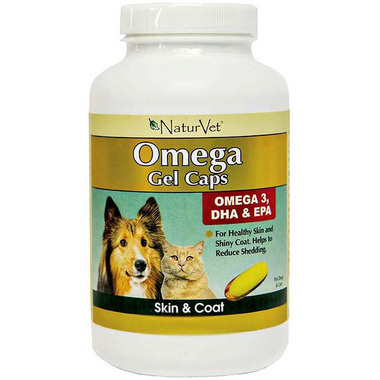 Naturvet Omega Gel Capsules are formulated to help maintain healthy skin and a glossy coat! For use in dogs and cats, Naturvet Omega Gel Capsules are here to ensure the health and look of your best friend’s coat! Guaranteed Analysis (Per 1000 mg Gel Cap): Vitamin E (D-Alpha Tocopherol) (5 IU), Omega 3 Fatty Acids (300 mg), DHA (Docosahexaenoic Acid) (100 mg), and EPA (Eicosapentaenoic Acid) (160 mg). All values are minimum unless otherwise stated. Ingredients: Fish Oil, D-Alpha Tocopheryl (source of Vitamin E), Gelatin, Glycerine, Water and Mixed Tocopherols.